When recording vocals what’s better than a great-sounding large-condenser mic? A great-sounding large-condenser mic that costs less than a high-quality XLR cable, that’s what. No longer handmade boutique items, today’s big-condenser bargains are assembly-line technical marvels cranked out en masse to meet the demands of a million bands. The trick is in knowing where the shortcomings of these mics lie, and how to overcome them. Although every mic has its own unique characteristics, I find that there are four typical problems that most often plague the lower-end models. Top on the list is strange artifacts: pops, sibilance, strange plosives and distorted consonants in singing or speech. Higher-than-desired self-noise is the second most common factor. Next would be harsh (or missing) high end, especially the magic “air band” above 10 kHz that the expensive mics capture so nicely. Lastly, many budget mics seem to create an unfocused phasey sound—which, incidentally, will not improve once the song’s been converted to MP3! Let’s look at each issue in turn, with some possible fixes. Plosives and artifacts: Start with a robust pop filter, or even two in line if absolutely necessary. Stedman makes very good pop filters which passes high end but reduces airflow. If the problem persists, have the talent sing or speak slightly to the side or over the top of the mic, provided it doesn’t adversely affect the audio quality. If your preamp has a de-esser, you may want to engage it. Use a broadband setting with moderate sensitivity and peak reduction (3–6 dB max) so as not to induce lisping. Avoid over-compression, which can make plosives stand out more in context. Last resort trick: if all these methods fail and a vocal track is laced with artifacts, I’ll go in and edit the waveform, pulling each artifact down in volume by 3–9 dB depending on the severity, and/or use the de-clicker function of the iZotope RX4 suite. Noise: Budget-priced mics often exhibit some degree of self-noise. Reserve noisy mics for strong-voiced singers who will naturally maximize the S/N ratio. Keep the mic fairly close to the source; it’s easier to roll off proximity effect than to deal with already-recorded broadband noise. Choose a quiet, good-quality preamp which won’t add more noise. Of course, make sure any room noise is kept to a minimum so as not to compound the problem. Don’t over-compress, as this will bring up the noise level. Last-resort trick: Gating a lead vocal track is a tough proposition because you can almost always hear it. Never attempt to gate at the recording stage but it may work at the mixing stage. If you must, use the gate only to reduce the noise floor, not eliminate it, with a slow and natural sounding taper. If the noise is really bad, you can try a cleanup utility like the de-noiser in RX4 that can “learn” the noise pattern and fairly transparently reduce it from the track. Harsh (or missing) high end: Few budget mics can produce the sweet airy presence of their high-dollar counterparts. Some have a harsh, scratchy-sounding high end. I haven’t found a solution to this other than to roll off the highs with EQ. Assuming the low and mid frequencies sound good, this will (hopefully) leave me with a warmer sound akin to a ribbon mic. If the high end is lacking, boosting it with EQ often won’t help—it’ll just add noise, not more voice. Instead, try an exciter. Most exciter circuitry works by generating artificial upper harmonics from existing frequency content; used in moderation (emphasis on the word “moderation” here! ), it can make a dull vocal track glossier than a BMW dealership. Last-resort trick: If your preamp has adjustable impedance, adjust it—or try a preamp with different impedance. Changing the impedance can have a huge effect on the frequency response of some inexpensive mics. Phasey, unfocused sound: A common ailment of bargain-basement mics. This is one of the most difficult to treat. Try to minimize side reflections by placing the artist in a treated corner or vocal booth. 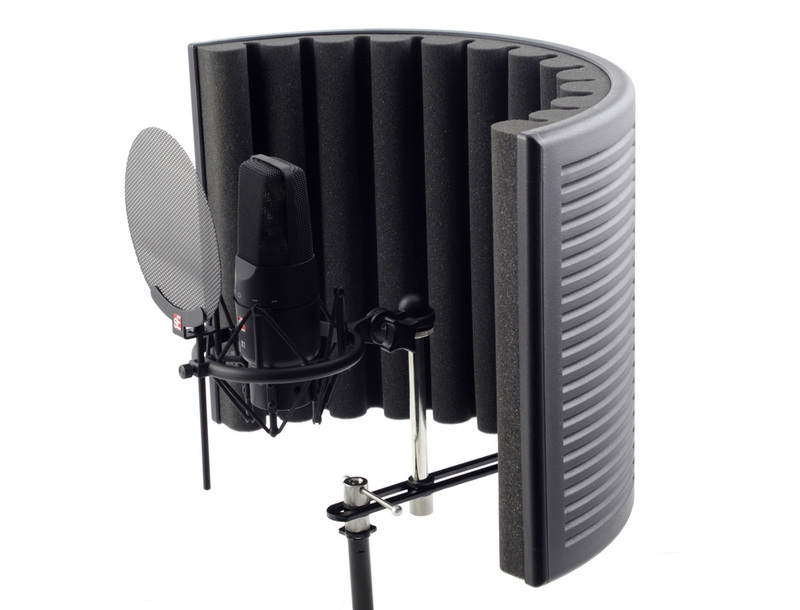 If none are available, an ambience-reducing device such as sE Electronics’ Reflexion Filter, the Primacoustic VoxGuard, or the RealTraps Portable Vocal Booth may help. Try different mic angles and distances. If you are using a stand for scripts or lyrics or notes, avoid stands with solid flat surfaces and cover the stand with a cotton cloth to avoid first reflections from the stand itself. Angle it so script pages aren’t perpendicular to the mic axis point. Last-resort trick: Unplug that nice warm-sounding tube preamp and connect a clean solid-state model for a little more focus. An old but good trick is to rubber-band a wad of pure cotton to the backside of a mic, covering the entire back of the capsule, to reduce additional phase issues. This is most applicable to cardioid patterns in a reflection-controlled environment. It works great even on more expensive mics such as the U87. These problem-solving steps may not make your Radio Shack special sound exactly like a vintage Neumann. After all, name-brand condenser mics wouldn’t cost that much if they didn’t bring some real magic to a recording. No mic is perfect for every singer, though, and there are definitely times when a budget-brand mic leaves the others in the dust. Compensate for a few sonic shortcomings, and nobody’s going to care what you paid.